Home > News > Digestive disturbances? Traditional Chinese medicine and herbs may help. Digestive disturbances? Traditional Chinese medicine and herbs may help. Digestive disturbances? Here's how traditional Chinese medicine and herbs may help. According to the GUT Foundation of Australia, approximately half of the population complain of a digestive problem in any 12-month period. Other research shows gastrointestinal health is essential for healthy metabolism and optimal functioning of all body systems. In this article we'll outline the foundational basics of the digestive system according to traditional Chinese medicine (TCM) and discuss herbs that support or restore healthy digestive processes. Digestive symptoms such as reflux, burping, burning or nausea can be viewed as a disruption of the fundamental, energetic mechanism of digestion, which in TCM, is viewed as a partnership between the Spleen and Stomach. The flow of energy (Qi) usually travels downward according to TCM philosophy but problems with digestion, are often characterised by situations in which the energy flows upwards instead. This situation is referred to as Rebellious Qi in TCM, and can lead you to experience symptoms in the form of reflux, burping or burning. Similarly, in TCM bloating is often recognised as being due to constrained Stomach Qi, and constipation can be due to Stomach Qi failing to move in its usual downwards direction. Herbs have been used to relieve digestive disturbances such as reflux, nausea and indigestion for hundreds of years in both traditional Chinese medicine and Western herbalism. Here are a few important examples. Globe artichoke (Cynara scolymus) has been used in traditional Western herbal medicine for the relief of bloating, feelings of fullness, indigestion and digestive discomfort, as well as to assist and promote the production and flow of bile (which is an important aspect of optimal digestive function). Chinese yam (Dioscorea oppositifolia)is traditionally used in TCM to address symptoms of diarrhoea and reduced appetite. From the perspective of TCM, it does this by strengthening the Spleen and Stomach Qi. German chamomile (Matricaria chamomilla) is used in traditional Western herbal medicine to relieve mild spasmodic symptoms and inflammatory conditions of the gastrointestinal tract. It has also been used to ease indigestion, flatulence, bloating and burping. Black atractylodes (Atractylodes lancea) is traditionally used to dry Dampness in the gastrointestinal tract in TCM, which in turn may help to resolve symptoms such as nausea, diarrhoea, poor appetite, and abdominal bloating or pain. Goldthread (Coptis chinensis) and evodia (Tetradium rutaecarpum) are often used together in TCM herbal formulations. Goldthread is traditionally used to help relieve reflux, abdominal bloating and nausea, and from a TCM perspective it also clears Stomach Heat and relieves Dampness from the digestion. Evodia is traditionally used to assist when there is the sensation of sour regurgitation, nausea, vomiting or loose stools. There can be many reasons for digestive problems, including eating too much or too quickly, consuming alcohol when eating, gastrointestinal disorders and food intolerances. Dietary changes may help to manage some signs and symptoms, however, for some, this is not enough. 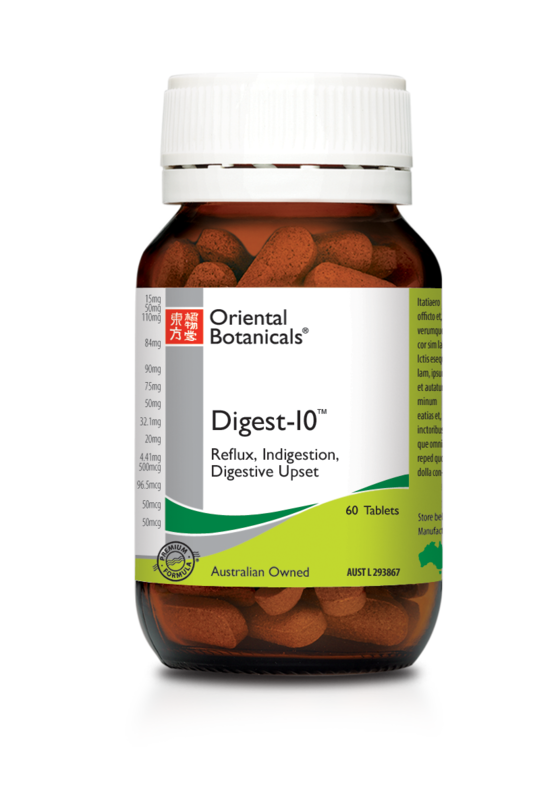 Oriental Botanicals Digest-10 combines the herbs outlined above and more. Based on their use in traditional Chinese and Western herbal medicine, it may aid digestion and relieve mild digestive upsets, including indigestion, nausea and reflux.